Jia Zhou is part of the Frankfurt MBA (full-time) and a member of Commerzbank AG. 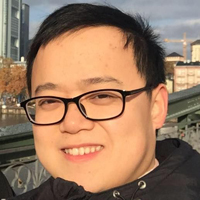 My name is Jia Zhou, a current student of 2016 MBA class at Frankfurt School. As a Chinese student who got 5-years work experience at a leading German bank, Die Commerzbank AG, I would like to thank the FS and the hosts for inviting us to within the European Chinese Banking Day on November 16. This Forum brought specialists, market participants, regulators, central bankers and the real economy together for an extensive communication of knowledge and thoughts. 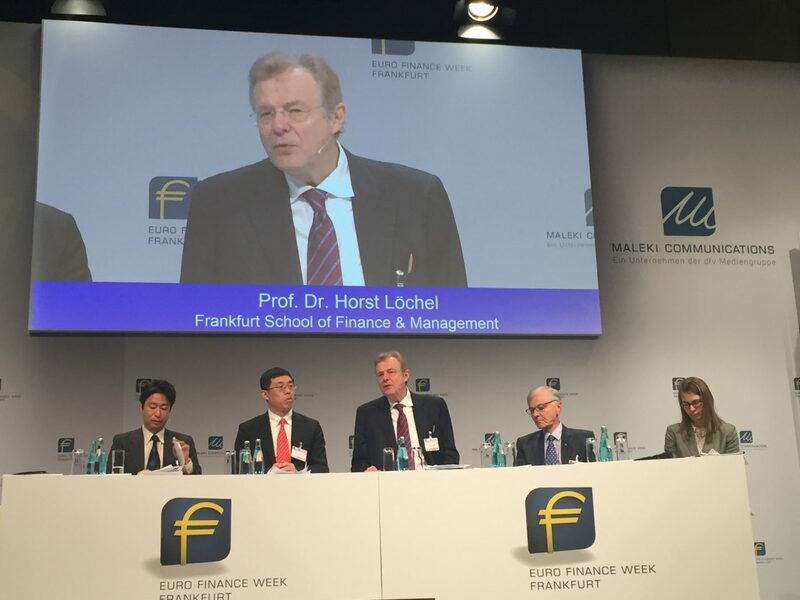 The high density and diversity of experts from China and Europe, including Prof. Dr. Löchel, Professor of Economics at FS and MBA Programme Director, together here in Frankfurt is a common strength of the attendances in what we all share as the same goal: to bridge the financial markets of the East and West. At the opening speech, Mr. SHI Mingde, Ambassador of the People’s Republic of China, made a very candid and pleasant presentation. He reaffirmed that China regards Europe as a valuable and crucial partner in the world’s economy. He also pointed out the expectation from China’s side, enhancing the RMB and China-related financial service. Compared with London, the current biggest RMB cross boarder center in Europe, Frankfurt has just got half volume of RMB clearing. But the trade volume between China and Germany is double as the volume with Britain, and German corporations, investing in China mainland, contribute 1.34 times as UK does. Therefore, especially in banking industry, the potentiality of utilizing RMB as trade currency between China and Germany is quite tremendous. Peking has addressed that the door is open, so I am convinced that the gaps such as exchange risks, the AML crisis, the KYC and TAX problems, the cultural differences and limited trust will be anyhow overcome. Just a month ago, in the light of the New Silk Road, one important milestone has been made, inclusion of the Renminbi into the SDR basket of the IMF. Frankfurt, as an offshore RMB clearing center and financial center of Europe mainland, will play a more denominal role in RMB-Euro money market. Obviously, this movement will also provide a new channel for European corporations and individuals to a huge developing market. China, as the second-largest economy entity, is changing the world economy and thriving businesses. Prof.Dr. Löchel, is acting as a chair in the session 2, “New Silk Road Opportunities-catalyst for the International Real Economy”. To ensure the utmost transparency and security, China Securities Regulatory Commission(CSRC) grants more flexible approvals for overseas investment by mainland China incorporated companies, like overseas listing while Bundesantstalt für Finanzdienstleistungsaufsicht (BaFin) grants the related approvals for the prospectus as feedback. Furthermore, according to the Chinese and German governments’ joint statement in June 2016, both will take actions to strengthen cooperation in advanced manufacturing industry, docking》Made in China 2025《 with 》Industry 4.0《. Advanced manufacturing and high-tech companies from both sides are able to take this opportunity to reach highly diversified institutional investors, gain visibility and enhance reputation, drive product potential in continental Europe, get higher reasonable valuation and enhance opportunities of cross-border acquisitions for Chinese companies. Overall, the China Day represents an ideal platform, covering a variety of topics regarding the financing situation between China and Europe, mainly about Germany. During the event, leading economists and regulatory experts discuss the challenges and impacts of the technology of Clearing Bank, qualified investing quota, Renminbi into the SDR basket of the IMF and the groundbreaking conception of the New Silk Road. Finally, but of utmost importance, the exchange of ideas and views about insights by these scholars and professionals make this event an outstanding one. As a Chinese, I am so proud of China’s contribution to the world. As a member of Commerzbank AG, I am so excited to foresee an expected bright future to the German banks and to these Chinese staffs like me. As FS MBA student, I am all delighted that I choose the Frankfurt School to have an excellent education at the right location.